Pecan production is widely popular across the United States, with commercial nurseries in Florida, Georgia, South Carolina, North Carolina, and many more. As a staple in southern cooking, pecans are quite delectable and boast a variety of health benefits. While it’s a fairly popular food item, pecan trees require plenty of time, patience, and dedication to produce top-quality pecans. On average, it takes 7-10 years before a pecan tree begins to produce a full supply of nuts. However, countless environmental factors can inhibit the growth of pecans, and, therefore, slow down production. To continue steady production of pecans, it’s essential to consider certain environmental factors and conduct plenty of research on the needs of your specific pecan tree/species. Simply changing up your maintenance routine can make a major difference in your pecan nursery. Georgia Pecan Nursery is a retail and wholesale pecan nursery. 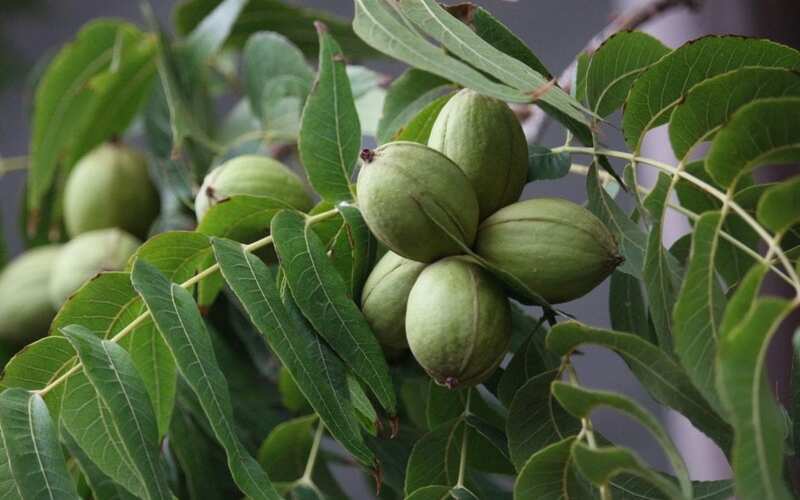 If you would like information on pecan trees for sale, contact our pecan tree nursery, today. Habitat: Pecans thrive in fertile floodplains throughout the southern and central regions of the US. On average, pecan trees do best when planted in properly drained soils that consist of sandy or silty loams. If they are cultivated in soil with a heavy clay presence, they will need extra care and monitoring. Since they can grow to 100 feet in height and 70 feet in width–roots includes–it’s best if they are planted on a spacious plantation and away from other crops and plants. Pests: It’s very common for pecan trees to attract various pests; however, it’s the diseases that these pests carry that you need to worry about. If the infestation is bad enough, your tree can stop producing pecans altogether and even die. Pollination: On a pecan tree, there are female flowers and male flowers. Unfortunately, both flowers do not blossom at the same time and cannot self-pollinate. Therefore, farmers must rely on cross-pollination for production. In the case of pecan nurseries, this is rarely a problem since there are plenty of other pecan species about. The above-mentioned factors are only a few examples of common pecan-producing inhibitors and factors to keep in mind. To ensure that you have a fruitful season, it’s important to think about the habitat you reside in. Is it compatible with the needs of a pecan tree? Is the soil clay-based or does it consist of sand or silt? It’s also essential to have pre-existing pecan trees of different species to ensure that your pecan trees are properly pollinated. Unfortunately, small flowers and plants won’t do the trick. Lastly, you must consider the damage that could be done by pests and their contaminating diseases. To put up your best defense against pests, you should have a proper irrigation system and excellent fertilizer. If your tree has been weakened by pests, the best way to reverse the problem is by giving your tree as many nutrients as possible. For example, soil that’s rich in organic matter and nitrogen sources will help bring your tree back to life and continue production. Soil that’s high in zinc is also beneficial. With these tips and tricks in mind, your pecan trees will continue to produce ample pecans. What Is A Grafted Pecan Tree? Website Designed and Developed by JLB | Subscribe to Our Newsletter!